The phenomenon of “climate change” has undoubtedly become one of the major concerns for the global community in the 21st century. Scientific evidence has proved beyond doubt the role of human beings in triggering unprecedented changes in the environment, beginning post-Industrial Revolution in the west. While the prolonged debate on climate crisis and how to combat it with mitigation and adaptation measures continue, so does the ever-increasing emission of greenhouse gases (GHG), especially carbon dioxide into the atmosphere. Countries with a long history of colonial exploitation in the southern part of the world point out to the historical emitters from the north, who, they feel, should bear the cost of remedial action. But even after more than 20 Meetings of the Conference of the Parties (COP) for the UN Framework Convention on Climate Change (UNFCCC), no acceptable solution can be seen. Meanwhile, people around the world are facing the fury of nature in the form of heat waves, cyclones and storm surges, floods, mountain deluge and drought. The worst-affected and most vulnerable people are those living in the deltas. India and Bangladesh share the largest deltas in the World—the Ganga, Meghna, and Brahmaputra (GMB) Delta. Millions of people in the Indian part of the Sundarbans (now also called Bengal Delta or in short IBD) and the Bangladesh Sundarbans Delta have been experiencing storm surges and cyclones over the past seven years. Cyclones such as Aila, Cidr, Nargis and Hudhud have caused devastation in the delta region around the Bay of Bengal. Aila affected one million people in the region, led to the breaching of 1,300-km long earthen embankment and put enormous debt burden on the people, who lost their homes and property. The post-Aila scenario witnessed an exodus of able-bodied men from the worst-affected community blocks in IBD. A pilot project study shows that more than 40 per cent of men have migrated not only to peri-urban West Bengal, but also to faraway lands, including Tamil Nadu, Karnataka, Kerala and Andaman and Nicobar Islands. The family life of these migrants has become disrupted and their future remains uncertain. Being mostly farmers and fishermen in their own homeland, they find no other job elsewhere than to work as daily wage earners in the booming construction sector. There was no initiative from the state or the central governments to ensure livelihood opportunities for them in their homeland. So, they become environmental refugees—a term yet to be acknowledged by the UN High Commissioner for Refugees, Universal Declaration on Human Rights or our own National Human Rights Commission and the West Bengal State Human Rights Commission (WBSHRC). Climate-induced displacement of people has also been recorded earlier due to submerging islands in the IBD region. 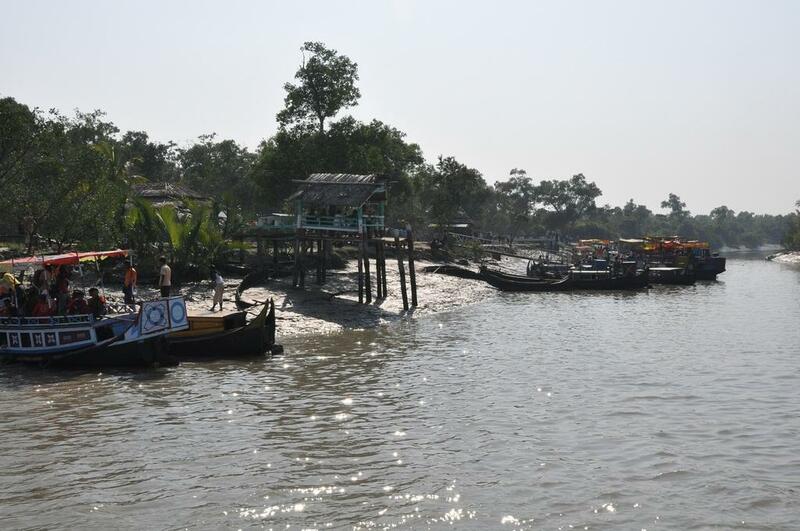 It is calculated that at least 30,000 people have left their homelands or have been resettled over a period of more than three decades from Ghoramara and Lohachara Islands to the nearby Sagar Islands in the Sundarbans. These people have been living in five refugee colonies. The early settlers who emigrated from the submerging islands were fortunate to get 0.13378038 hectares of land while those who arrived late got only 0.20067057 hectares. A study has shown that these people have been deprived of every major fundamental right mentioned in the Constitution, including the Right to Free Education, Right to Healthcare, Right to Work and Right to Food. The plight of these refugees will only worsen in the future unless the world wakes up now and takes a vow for collective action against climate change. A K Ghosh has been engaged for the past 50 years in administration, research and training work. He is the founder director of the Centre for Environment & Development, Kolkata, (established 1996) and is currently acting as the country lead on the issue of environmental governance and climate change in an international project. Did climate change cause cyclone Nargis? It is a imperfect article with qualitative pronouncements on climate forgetting silt deposition at the mouths of Ganga & Brahmaputra rivers joining the sea. This is the major concern. Cyclonic activity present a cyclic pattern. Firstly, the author must specify what he meant by climate change? Secondly, the author must specify what he means by scientific evidence? Has he done any such study in the Sundarban region? We have been working in ISD for 20 years.,fcussing on Action Reserch. Pleasesee Delta Vision document of WWF I, 2011 for the details of informations on which the blog was based, please also see ILLE Journal -Ind.J. Landscape System and Ecological Studies, 38(1),5 - 10, June, 2015. Also the papers from School of Oceanography, Jadavpur University.